Well, good people of the internet, it’s finally here! 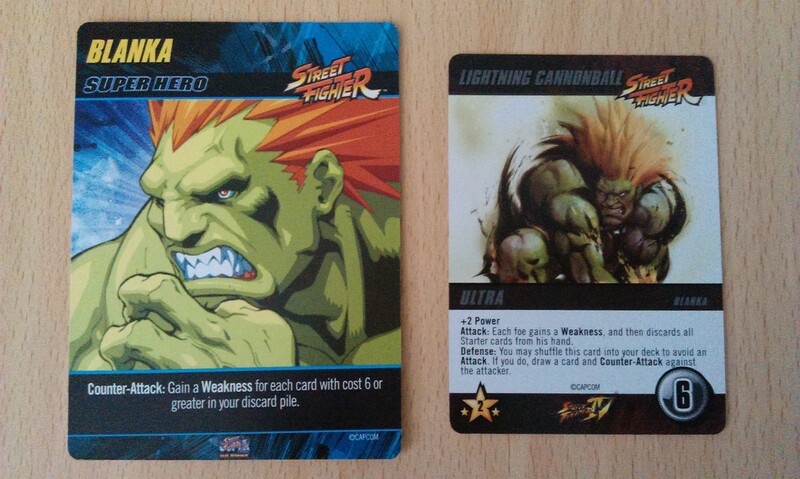 It’s nearly two months since I nearly burst several blood vessels in my excitement over the discovery of a Street Fighter card game, and lo! it has finally arrived in my hot little hands this very day! Oh, I am very excited! The game is published by Cryptozoic, who have done quite a few deck-builders now, including the popular DC game, and 3012, one of their early efforts that I feel is greatly overlooked. A deck-building game? I hear you cry. Well, yes – a card game where you basically build your deck as you play the game. I think it was Dominion that started the trend, and my own game collection includes quite a few of these, such as Thunderstone and Marvel Legendary. Each game is broadly the same principle – you start off with a basic hand of cards, which you use to buy better cards, and thus the game moves on. There are often many twists, as it can otherwise be a pretty boring thing (one of the biggest criticisms of Dominion, from what I’ve heard). Thunderstone, for example, involves some dungeon-delving, and both the DC and Marvel games involve powering-up your deck in order to take on super villains and win the game. While there are very few games that I could say I dislike, the whole deck-building genre is something that I can usually take or leave. As a kid, I was never all that into video games, but Street Fighter was one of these cult events that I can always make an exception for! Not that I played it that much, but still, it was a part of my childhood that I fondly remember – ahhh! 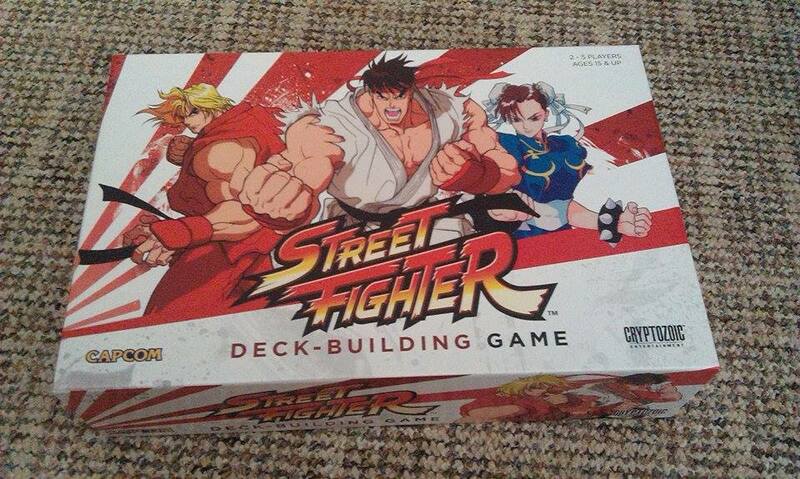 The Street Fighter card game was therefore an insta-buy for me, and when I got home this afternoon to find it waiting on my doormat, oh, the joy begins! The game is played very similar to the DC game, as both use the ‘Cerberus Engine’ (a game engine is just another name for the mechanics). You have a starting hand of fairly weak cards, with additional cards available to purchase, some (like the Kick cards) are in a stack to the side and available until that stack runs out; the rest form the ‘main deck’, and comprise Heroes, Villains, Equipment and Superpowers. Unlike in DC, Location cards form a ‘Stage’ deck, also to the side. This deck effectively replaces the Super Villains in the DC game, and acts as a sort of timer, that tracks the game’s progress. 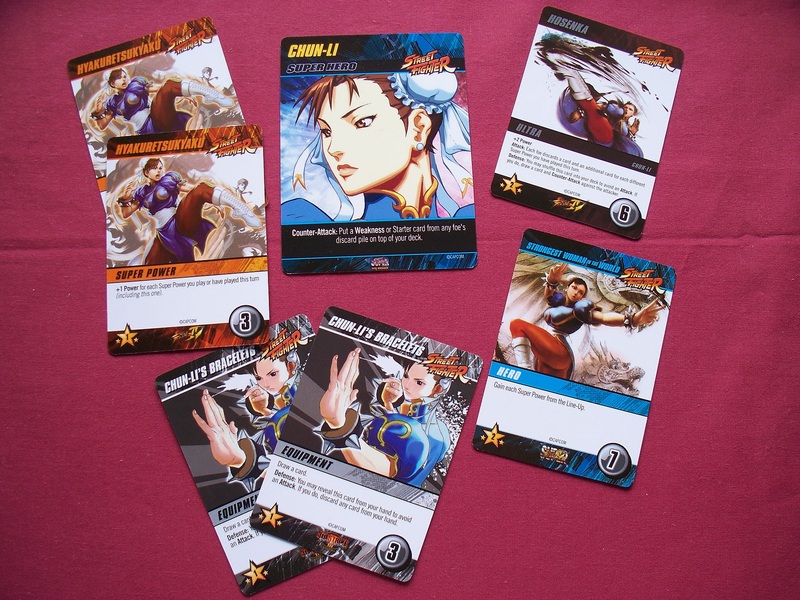 There are 14 oversized Super Hero cards, as in DC, but the neat little twist here is that, once the players have chosen their Super Hero for the game, the remainder act as ‘Stage Bosses’, which you must defeat in order to gain the current Location in the Stage deck – when the Stage deck runs out, the game is over. Also unlike DC, the Super Heroes don’t have a printed ability to use throughout the game, but instead a ‘Counter Attack’, which is resolved when you’re defeating the Super Hero in its Stage Boss appearance (and is analogous to the First Appearance – Attack that the DC Super Villains have). I thought that was pretty cool, anyway! Each location corresponds to a level in the video game, and the card art uses the same graphics that the video game used for the backdrop to the fighting. Nice! While the Super Heroes don’t have any printed abilities of their own, there is a new type of card added to this game, ‘Ultra’ cards. 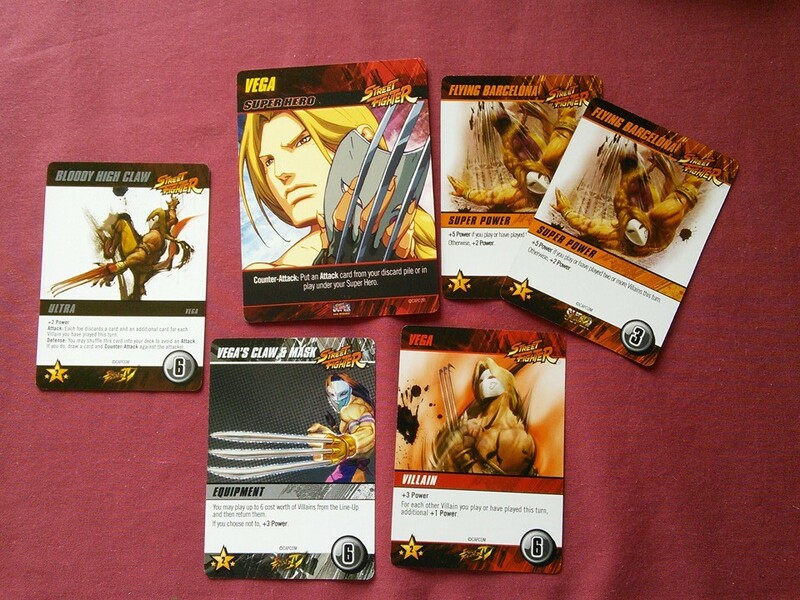 These are similar to the characters’ special moves in the video game, and at the beginning of the game are placed under the Super Hero card. As the game progresses, you have the option of buying the Ultra card as you would a card from the main deck lineup. Some cards in the main deck have either attacks, which allow you to attack other players, or defense, which allows you to defend against attacks from other players or from the Stage Bosses. Ultra cards, however, have both attacks and defenses, and can be used for either purpose. At the end of the game, you total the amount of victory points you have (starter cards are worth 0, and weakness cards are worth -1; all other cards are worth at least one point, and some have special conditions that increase their worth depending on the amount of specific types of cards you have), and the person with the most points is declared the winner. It’s really that simple! I do enjoy the DC game, and have frequently played it solo to try to get the best possible score, or to defeat the Super Villains in a set amount of turns. Most deck building games can be played in this way, though very few are all that satisfying. 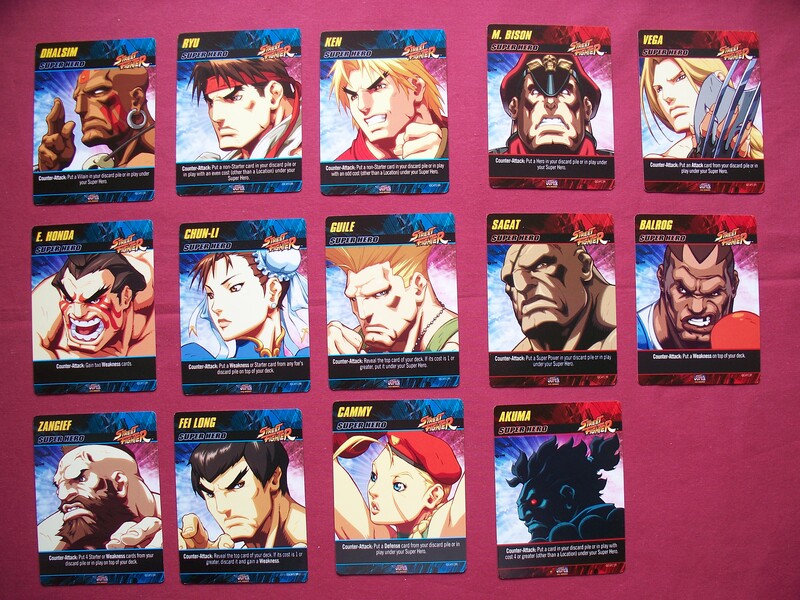 Street Fighter, however, begs to be played with more players, due to the amount of attack cards. I do love Street Fighter. I tried this game out solo earlier today to get a feel for it, and that level of interactivity was something that was definitely missing from the game. However, I can definitely see how this game would be awesome with more players! But let’s talk about promo cards for a minute. Many companies produce promo cards to promote their games at organized play events, and Cryptozoic is one of them. However, while that is a very noble cause, and a wonderful idea, promo cards often become so sought-after that it can become a serious problem. And Cryptozoic promo cards are some of the very worst for this. For the DC game, they produced a promo Super Hero, Martian Manhunter. I don’t go to game events, as I can’t justify the travel expenses. So instead I spent more money buying the promo card on the aftermarket than I had done on the game itself. An expansion for DC was released this year, Heroes Unite, which has two promos associated with it. I was one of the lucky ones to get my copy shipped with one, but spent as much as I’d spent on the game buying the second promo card. It becomes an untenable situation, and one that has, time and again, made me question whether I can continue to support the publisher’s games. See, I’m an obsessive completist, as many gamers are, and cannot abide to think of having an ‘incomplete’ game. And this is where the problem lies. One of my favourite publishers, Flying Frog Productions, insist that they would never produce a promo that altered the gameplay of any of their products, so have produced maybe a handful that are strictly alternate-art cards for their games, which often ship with their web-exclusive mini expansions. I have no problem in supporting a company by buying their content directly from them, especially if I’m going to get a nice little promo into the bargain! My favourite publisher, Fantasy Flight Games, produce alternate cards as promos for game events, but never produce actual promo cards. And this is how it should be, in my view. Promo cards should not be additional content, but variants to the main game. Yes, you can play DC without Martian Manhunter, but that doesn’t stop the fact that there are more heroes out there that you can play with if you’re willing to part with the money. You can play Street Fighter without Blanka, but that doesn’t stop the fact that he’s out there, and can be yours for more than the price of the actual base game itself. It’s time game companies stopped supporting this shady aftermarket by producing what are essentially mini expansions as promo material. Anything game-changing deserves to have a wider audience than just for those with wallets big enough to pay the exorbitant prices eBay sellers charge. Take a stand with me! But enough of my rant. I’m off to write some more essay. I’ll end with a quote from a favourite web personality of mine: Until next time – play more games! Enjoy a bit of Chun-Li! 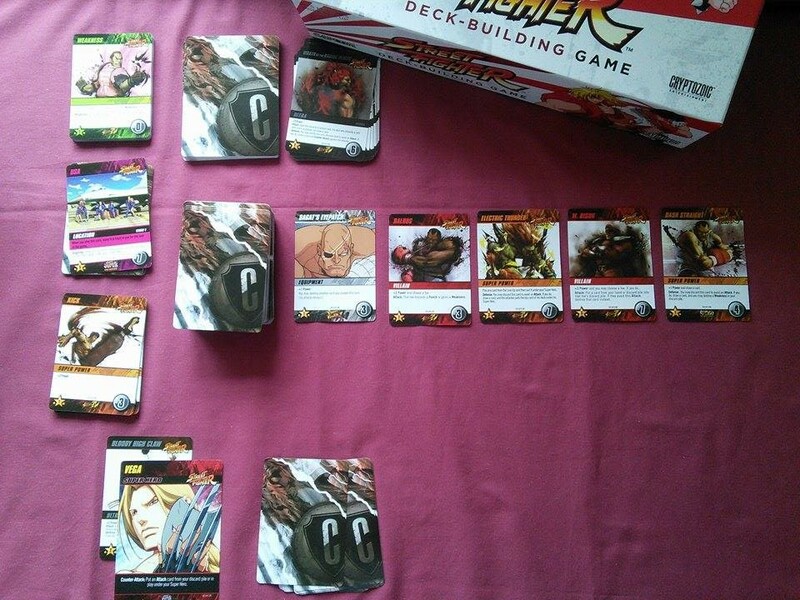 Author spalanzPosted on April 30, 2014 October 6, 2015 Categories board gamesTags board games, card games, Cryptozoic, deck-building games, game day, promo cards, Street FighterLeave a comment on Street Fighter! While I’m still woefully behind on the essay (though I’ve managed to churn out 65 words of introduction, so that’s nearly 4% of the work done already! ), I’m here again because I have some exciting times that I want to share! 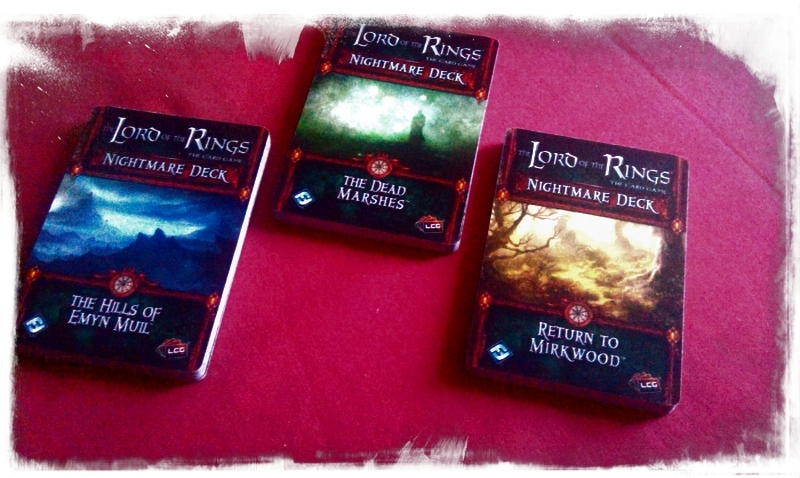 First of all, I took delivery of the nightmare decks for Lord of the Rings LCG, part two of the Shadows of Mirkwood cycle. This is a card game that I will talk about at length soon, because it’s probably my favourite card game in the whole world. Yes, that’s right folks! So unless you know the game already, this whole paragraph probably won’t mean very much to you, but I want to share it anyways. The decks arrived yesterday, though I was entertaining so couldn’t really check them out until today, and my goodness, they’re looking good! I probably want to try out Hills of Emyn Muil first, because that’s my favourite quest of all time (spoiler alert! ), but from looking at the previews already released on FFG’s website, Dead Marshes looks absolutely wonderful! There are some pretty vicious cards in these decks, so I’m going to look forward to trying these out soon! I bought a back issue of Star Wars Insider magazine last week – remember me talking about the short story Heist, by Tim Zahn? Well I checked through my stack of magazines and was horrified to discover I didn’t have it! So off I trundled to the Titan Magazines website, ordered it, and they’ve sent me the wrong issue! Dammit. I was hoping to be able to read more Zahn goodness, but clearly not. 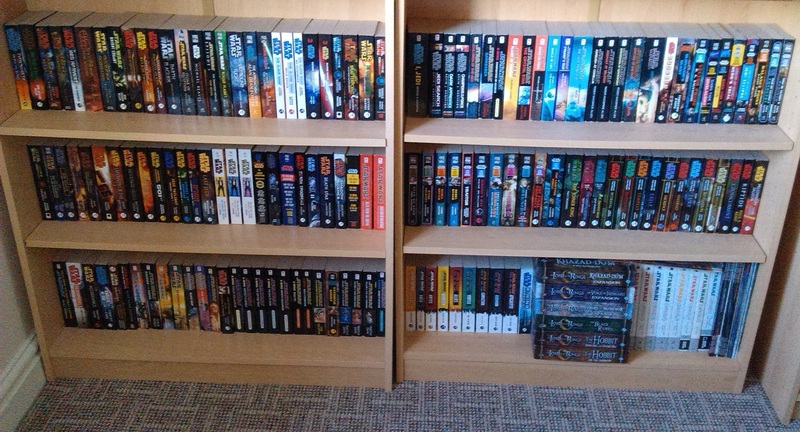 I haven’t made it to any more Star Wars novels since finishing Choices of One at the weekend, but I’m hoping to get a couple of short stories read this week, so I’ll talk about them further down the line. Yeah, you can go ahead and get excited about that! Back to exciting times, though! I have decided that it’s high time I made good on a sort-of promise I made to myself a good many years ago now, and try my hand once again at creative writing. And where better to showcase it than here, on my very own blog! So that’s something else for you to get excited about! Basically, when I was in college I decided I wanted to try writing some Star Wars stories, because while I enjoyed all the stuff I could lay my hands on, I felt like there weren’t enough of the kinds of stories that I wanted to read out there and available. So I gave it a go, never getting very far, and real life always got in the way of course. But I’ve always enjoyed writing (that’s one of the reasons I started this blog), so whether it’s good stuff or bad stuff, I’m going to do it anyway, and then share it with you guys! And procrastination over the essay is absolutely not the reason I’m going to be doing this! So I’ll give you a sneak preview. I’m currently writing a short story based in the Star Wars universe, set around 3 years before the events of A New Hope. I’ve pretty much got it planned out now (in fact, I’ve planned a small series’ worth! ), but have yet to actually start typing. With luck, I’ll do that at the weekend. But once it’s done, I’ll post it up for your enjoyment! As I’ve said, I’ve got vague ideas for about half a dozen stories in a kinda series, so I hope to pursue this over the summer, and for better or worse, we’ll see where it goes! That’s all for now, anyway! Stay tuned for more geekiness to come, soon! I started this morning with scrambled eggs, which is always a good way to start the weekend. And what a weekend it has been so far! My great procrastination continues – I’ve got to write an essay by the end of next week, and while I’ve been thinking about it (honest), I have yet to put fingers to keyboard. And yet here I am, blogging . Shocking! In case you’re wondering, I’m doing a degree with the Open University in History with Classical Studies. Because I love history (it’s in my tagline, remember!) and I love the Classical World. I’m currently nearing the halfway point – with this essay, and an exam at the beginning of June, that’ll be me exactly halfway through. OU degrees, unlike ‘regular’ degrees, take six years to complete rather than three, and I’m on the cusp of the end of the first module of my ‘second’ year. If that confuses you, you’re not alone. Anyway, the current module I’m nearing the conclusion to is A200, Exploring History: Medieval to Modern. It’s been really really good, I have to say! A lot of people doing the current course with me seem to be really down on it, as it’s too much reading or whatever, but seriously, the study of history involves a whole ton of reading, so I’m not entirely sure what they were expecting. History is more than just interesting stories, people! And thus I dismount my soapbox. The essay I’ve not yet started on is about territorial expansion, with reference to colonialism in Africa in the nineteenth and early twentieth centuries. Awesome stuff! I’ve technically had last week ‘off’, for Easter, so instead of working at the degree, I’ve been reading more Star Wars novels. Of course! Despite the recent announcement, I still have a huge love of the expanded Star Wars universe, not least because these are the stories that I grew up with – none of this Gungan flapping nonsense, but Hutts building Death Star-like superweapons, and blue-skinned alien Grand Admirals running rings around the fledgling New Republic! Oh yes! That’s the good stuff! And I doubt that anything Disney puts out from here on in will dissuade me from that. 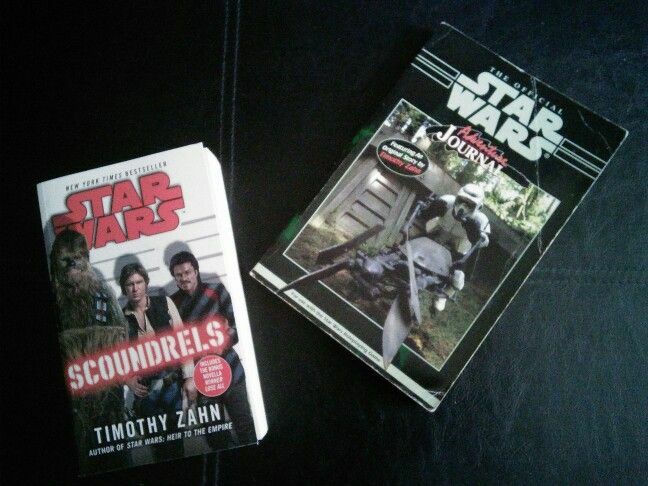 This week’s book has been another Tim Zahn treat – Choices of One. Amazon tells me I’ve had this book getting on for two years now, and yet this is the first time I’ve actually bothered to pick it up. It’s a sequel to Zahn’s Allegiance, which is set during the three years between A New Hope and Empire Strikes Back, and follows a similar plot, featuring the renegade stormtroopers self-styled as the Hand of Judgment. All the favourite rebels are there, including General Riekkan and General Cracken (a real surprise treat, that one!). Luke is the noob who still doesn’t know how to be a proper Jedi; Han is still the rogue who is unwilling to commit himself to the Alliance, and Leia is very much the authority figure we see her on Echo Base. In addition, we have Mara Jade as the Emperor’s Hand, running around rooting out treachery in the Imperial ranks. We also have the star destroyer Chimaera, and while Pellaeon is here, he’s not yet the captain of the ship. A really nice inclusion, that. The plot is all centred on a far-flung star system, where the Imperial Governor is accused of treason (hence Mara’s involvement), and deals with a nebulous threat lurking from the Unknown Regions. Voss Parck and the Adjudicator are also involved, which is a nice nod to Zahn’s shorter fiction that deals with Thrawn’s adventures in the time of the original trilogy. Basically, I really liked this novel a lot. Perhaps even more so than Allegiance. As usual for Zahn, you see plenty of the puzzle pieces, but they don’t begin to connect until later in the game, and I’m either lazy or I was kept guessing right up to the final pages. Something I really, really liked was the way he keeps us guessing as to the identity of Lord Odo. (SPOILER ALERT: I was fairly convinced it was going to turn out to be Thrawn, but no!) The warlord threatening the galaxy from the Unknown Regions, Nuso Esva, was a really intriguing threat – while we didn’t see much of him (SPOILER ALERT: or did we?! ), he was clearly a compelling antagonist, with a very intricate plot set up. Nicely done, Mr Z! MORE SPOILERS: The Nuso Esva plotline isn’t actually resolved here, however – for that, you have to head over to the 20th Anniversary edition of Heir to the Empire, and the short story ‘Crisis of Faith’ that is included therein. This morning, I took delivery of the fifth adventure pack for the Pathfinder Adventure Card Game. At least, I think they’re called adventure packs. Well, whatever. I’ve been off-and-on playing this game since last September, when it first arrived in my hot little hands. I mean, more off than on – I’ve by no means been playing it constantly, or anything! In fact, my boardgamegeek stats tell me I’ve played it seven times since I had it. (I’m on boardgamegeek as ‘spalanzani’ – feel free to add me as a geek buddy!) The game was something of a sensation when it came out – the forums were absolutely crazy with new posts, to the extent that I had to unsubscribe pretty sharp-ish as my subscription feed was just spammed daily. 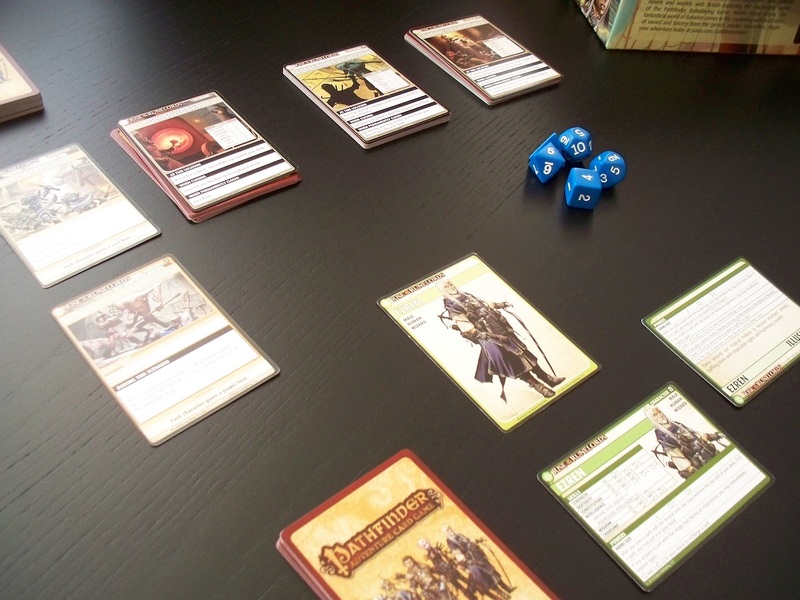 The idea of a game that was “the perfect amalgam” of card game and RPG seemed to scratch a lot of itches across the ‘geek, and of course, the Pathfinder RPG was close to a lot of peoples’ hearts. The box follows the Rise of the Runelords adventure path, a linked series of six adventures in the Pathfinder universe. I’m saying all this like I know what I’m talking about, of course – while I do indeed have the Rise of the Runelords RPG book, I’ve never actually played the RPG, so have no idea what it’s like. The RPG engine is, I believed, licensed from Wizards of the Coast’s D&D 3rd edition system, which I have also not played, but I have played d20 Star Wars RPG (Saga Edition), which I believe to be a similar engine. But all of this is pretty tangential to the actual discussion. In the card game, you pick a character and have a deck of cards, which represents your “life” in the game – if the deck runs out, you die. You have a series of locations, represented by cards and an associated deck, that you have to explore. Within each location’s deck can be anything, from items and spells you can try to acquire, to monsters and even the villain of the piece! You have to fight these monsters, which is a skill check based on your character’s stats and a die-roll (the RPG element). Once you explore the locations to meet the win conditions of the scenario you’re playing, usually beat a villain in combat, you have a reward, which so far for me has been drawing a card from those unused in the box, or adding bonuses to your skills that will help in subsequent adventures (again, the RPG element). Ready to go with Ezren! By rights, I should be obsessed with this game, and I should be far too over-excited each month as Paizo sends me the new adventure pack (I’m just calling them that, whether they are or not!). But I find the game oddly dissatisfying. Like I said before, I’ve been playing it intermittently since September, and have taken Ezren through all the scenarios up to the midway point of Burnt Offerings. However, there is something missing, for me. While I enjoy the levelling aspect, and the dice rolling and the fantasy locales, I find myself feeling like I’d much rather play a proper RPG. For me, RPG-ing is a terrific social opportunity for storytelling and having fun while exercising the imagination. I suppose the ‘anything can happen’ aspect of the RPG is lost when you’re straightjacketed into the same mechanic of exploring locations and fighting monsters. Yes, arguably that’s what most RPG-ing comes down to, but there can be so much more variety in games where you can concentrate on diplomacy or any other of a multitude of types of quest. Plus, crucially, the presence of a GM in a RPG leads to so much more interactivity than we have here. So what we’re left with is a bit of a hollow shell of a RPG. Harsh, I know. When approached as a card game, it is much more enjoyable to play, but I find this game wants to be a RPG too much. Which is probably why I only play it in short bursts. So today sees the big announcement that we’ve all been waiting for since January. Well, maybe not *all* of us, but I’ve been pretty keen to see what’s going to happen to the Star Wars expanded universe. You may or may not know, but following the acquisition of the Star Wars IP by Disney last year, and the subsequent announcement of more films on the horizon, a ‘story group’ was set up to decide which stories were part of the official Star Wars timeline, and which would be left out. After four months, the announcement has been made! Bottom line, the timeline established by the EU has essentially been discarded, but the elements that have gone into making it such a rich universe now form a sort of pantry that new authors can go into to create new recipes. In a manner of speaking. You can read all about it here. There’s also a really nice youtube video! An important announcement about the Expanded Universe. I have to say, I don’t really know how I feel about this. Reading through a lot of the comments posted on facebook about this, it seems a lot of people were expecting it to happen, and I must say I agree with the sentiment. I mean, short of essentially filming some of the stories that have been set post-Return of the Jedi, there’s pretty much nowhere they could set new films in the already-established timeline. Given a new company has just acquired the property, I suppose it’s natural they’d want to de-restrict the land to tell whatever stories they want. The existing stuff isn’t entirely going away, but will remain in print with the “Legends” banner across the cover. So essentially there are now two timelines, which to be honest isn’t such a great stretch for me personally. For a while, I’ve maintained “my own” timeline, where I prefer to just ignore certain stories as if they aren’t part of the canon. So that part’s not going to upset me too much. Though the upcoming prospect that major plot points are going to be completely thrown out the window is really unsatisfying. The biggest one, I suppose, is the thought that Luke Skywalker will no longer be married to Mara Jade. Perhaps the most interesting character to come out of the entire EU (discuss in the comments! ), it would be a real shame to see that whole thing forgotten. Perhaps unsurprisingly, that prospect is making me feel, like a lot of others in comments, that I have a whole bunch of books that I’ve wasted so much money on, if they’re no longer part of the universe. Back when the Story Group was announced in January, my initial thoughts were that we would see certain milestones in the fiction being kept, while others would be weeded out as “untrue”. As I’ve said, I’ve more-or-less been doing this myself for a while now, with my own “fanon” of stories that I consider to be “correct”. The prospect of losing some of my “fanon” to the axe of the SG was a bit dismaying, if I’m honest, as I love this universe, and the last thing I want to do is exist in a vacuum where my “fanon” doesn’t correspond with that of the “canon”. So wiping the slate clean does remove the potential mess. The EU has got some really awesome stories, though, and it’s going to be really quite sad to think that we’ll be seeing these stories consigned to oblivion. I suppose that puts the pressure onto Disney now to come up with something that will be good enough to replace that. The gauntlets are down, I suppose! For a lot of fans, Tim Zahn’s Thrawn Trilogy is a seminal work in the universe – forgetting the fact that it single-handedly resurrected the franchise in its darkest hour during the early 90s, and thus arguably renewed interest enough to pave the way for the prequels, it’s an awesome story with a slew of compelling characters, including the aforementioned Mara Jade. To say that this is now not what Star Wars will be is, to me, a massive disservice to the work of the authors and artists who kept the universe going through the years. Ah, here we are again! 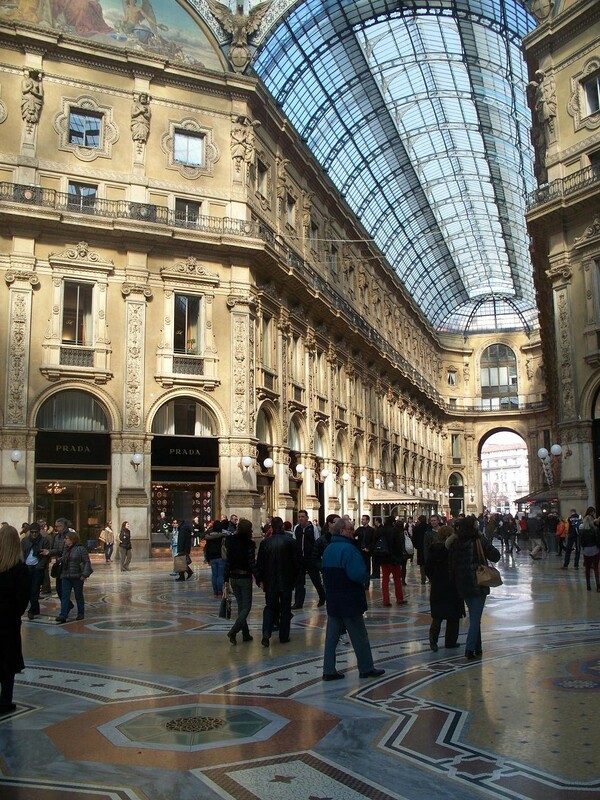 For my fourth blog, I’d like to reminisce with you good people of the internet about a trip I took to Milan last year. Sigh! It was a really good trip! 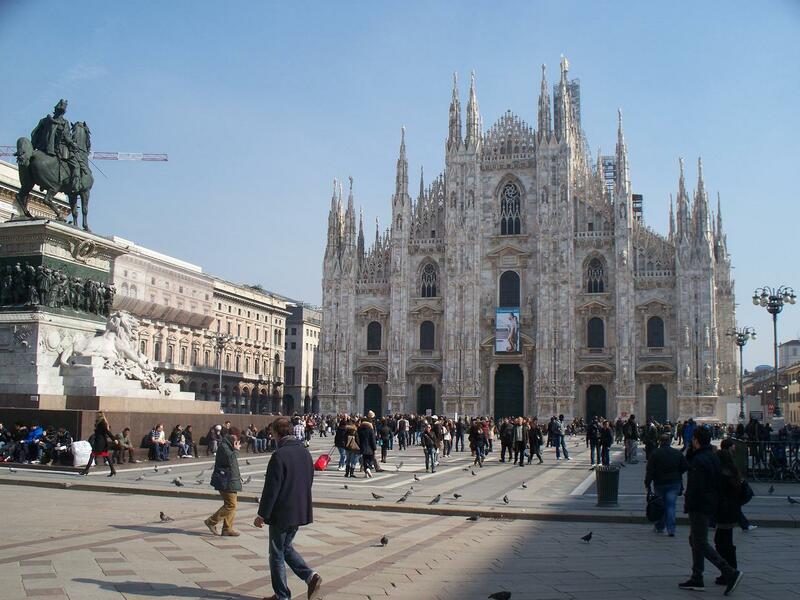 I’d never been abroad by myself before, but after constantly hearing it broadens the mind, and suchlike, I decided I wanted to make good on what had been a years-long desire to visit Italy, by going to the city with the highest density of English speakers in that country. So off I trundled, and despite the terror of being in a foreign country where I knew nobody and could just about get by in the language, it was a really great time! 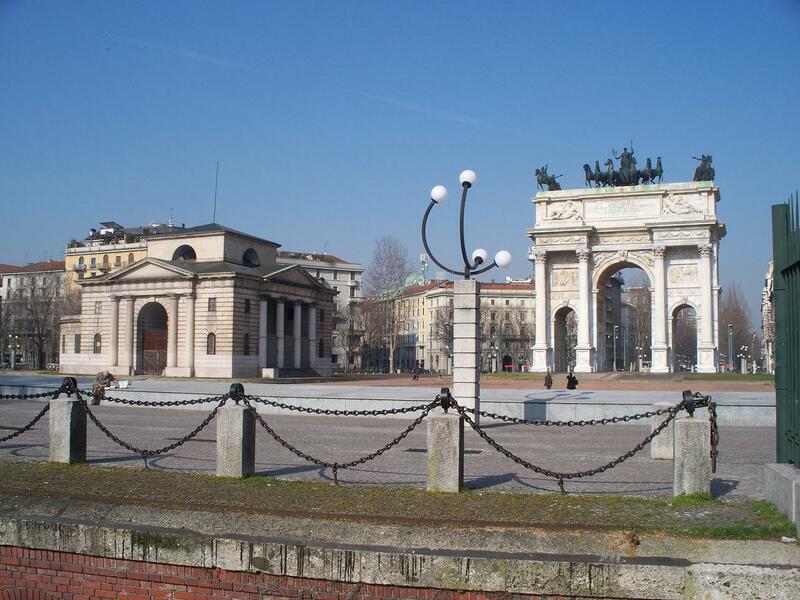 Milan is an old city, with as rich a history as any other of the renaissance centres of Italy, though because of that rich and varied history, the city doesn’t look like Florence, or Lucca, or Bologna. Instead, what struck me most when I arrived was how much the city reminded me of London, with a lot of big, stone buildings that makes the experience almost like a walk down Whitehall. 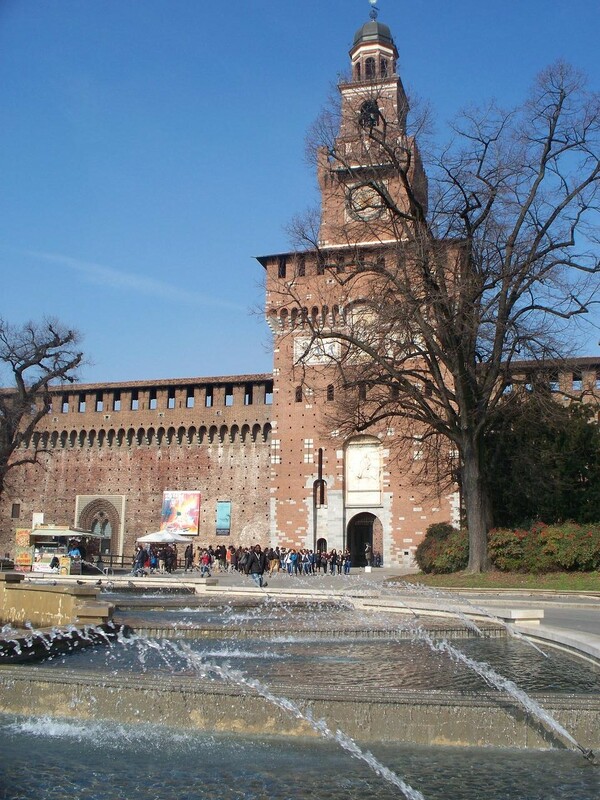 However, renaissance Milan still survives, not least in the Castello Sforzesco. 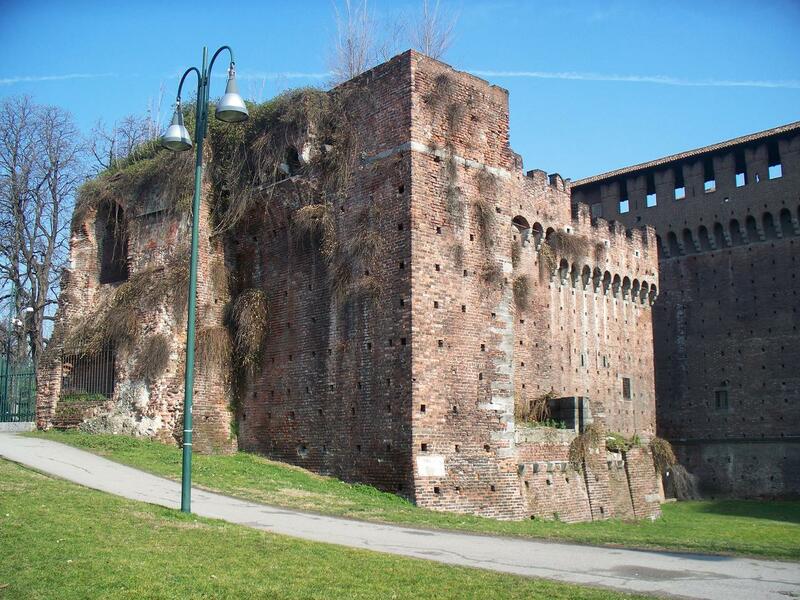 The Castello is now an art gallery and museum, but it still looks pretty awesome! The city was an independent duchy until the sixteenth century, when it became a Spanish possession. Following the War of the Spanish Succession, however, it was ceded to Austro-Hungary, and during the eighteenth century – the Age of Enlightenment – rebuilding has created the look we see today. 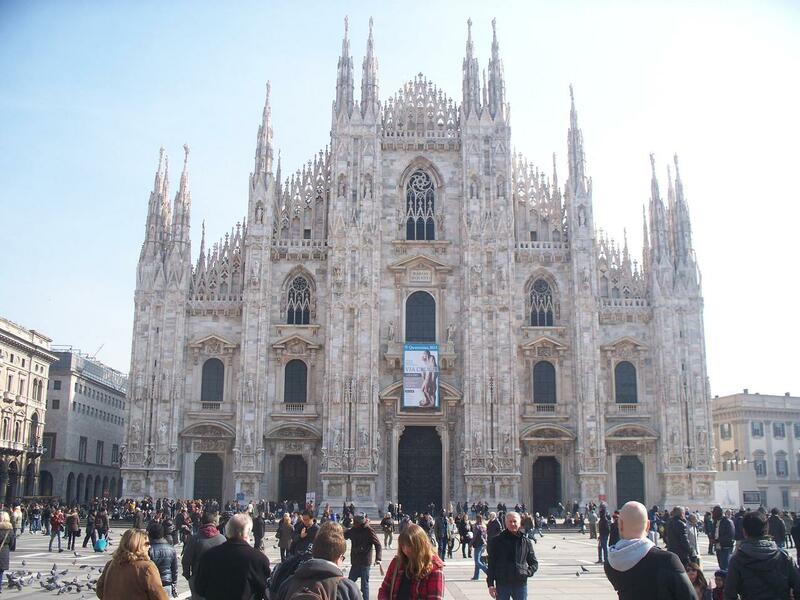 The centrepiece of the city is the Duomo, the Cathedral of Milan. 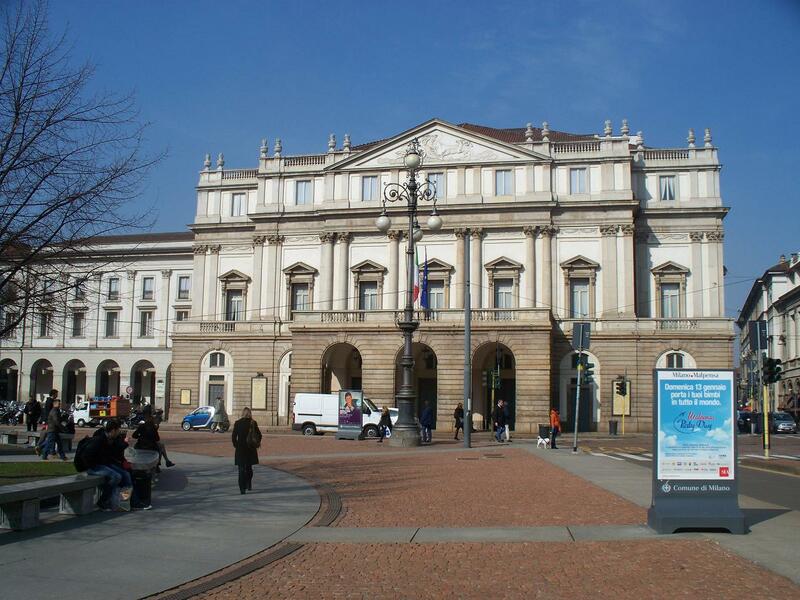 Started under the Visconti Dukes of Milan in the fifteenth century, the white Carrara marble that fronts the church and gives it such a stunning appearance today was added for Napoleon Bonaparte’s triumphant entry into the city in 1805 for his coronation as King of Italy. 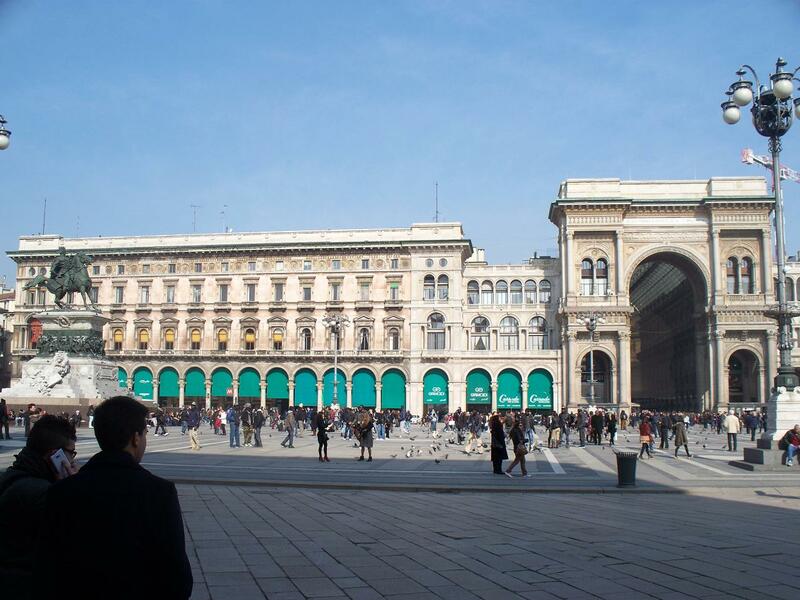 Emerging from the Galleria Vittorio Emmanuele into the Piazza del Duomo had a really stunning effect on me, I must say! 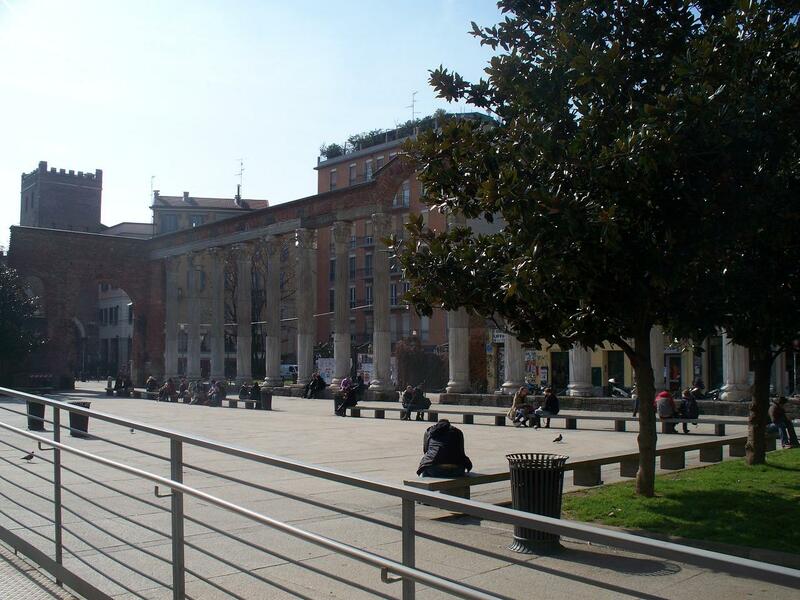 I met a Canadian chap in the Piazza, who was also travelling alone and was overcome with relief to meet someone who also spoke English! Ah, marvellous! The Duomo is free to enter, but remember that Italy is a staunchly Catholic country, and here the army were guarding the entrance preventing access to anyone inappropriately dressed – they turned one woman away in front of me because her skirt ended above the knee. Inside, the building is surprisingly dark, but I have no pictures because I couldn’t find anyone to buy a photography permit from! 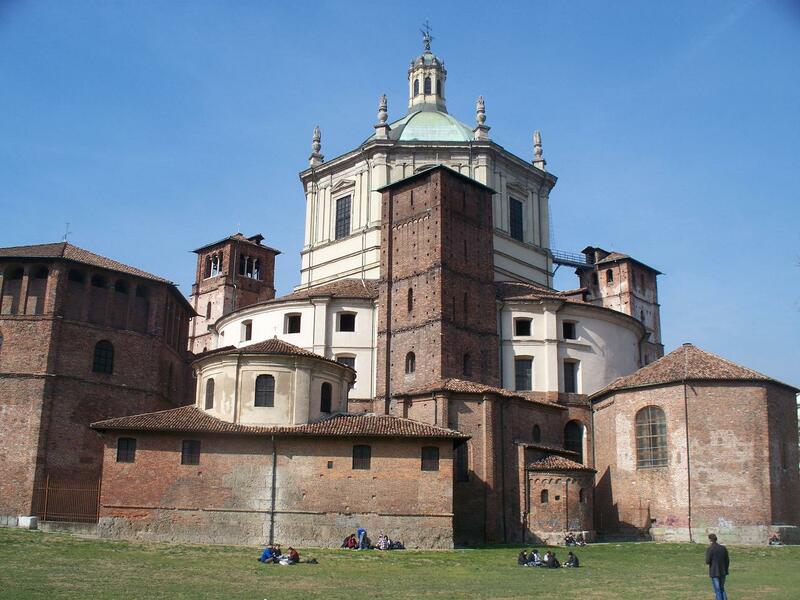 There are more churches in the city than just the Duomo, of course. 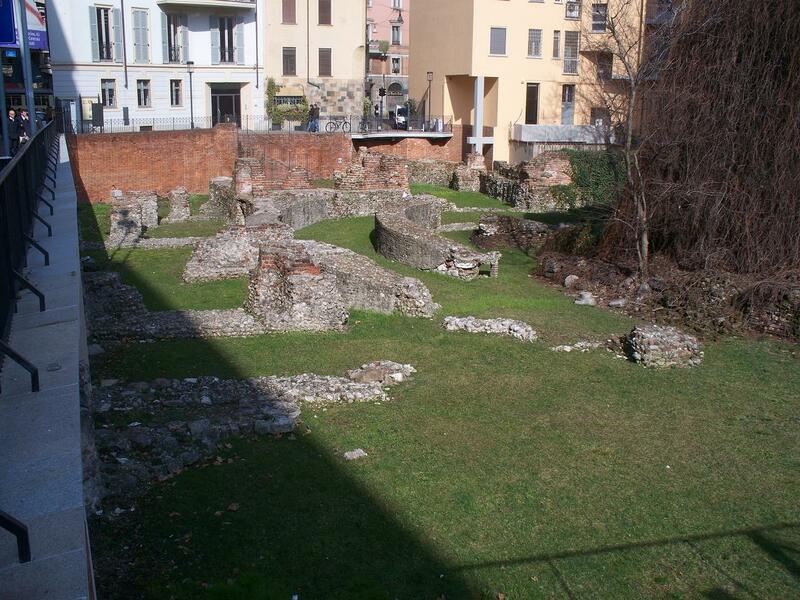 The most impressive, I found, was San Lorenzo alle Colonne, just a short walk from the Duomo. 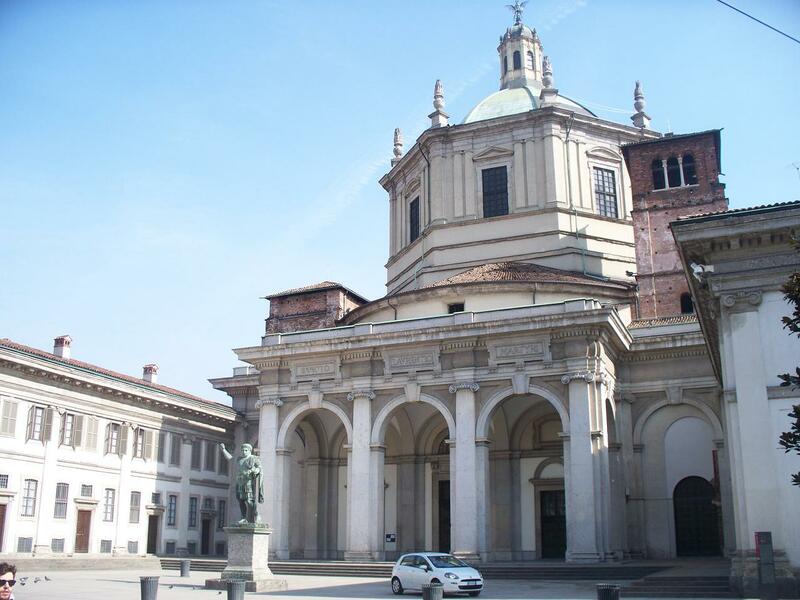 The rear of San Lorenzo alle Colonne. Public executions used to take place here in the middle ages. The name comes from the columns that run in front of the church, which were brought there when the church was built in the fourth century from either a Roman temple of bath house. 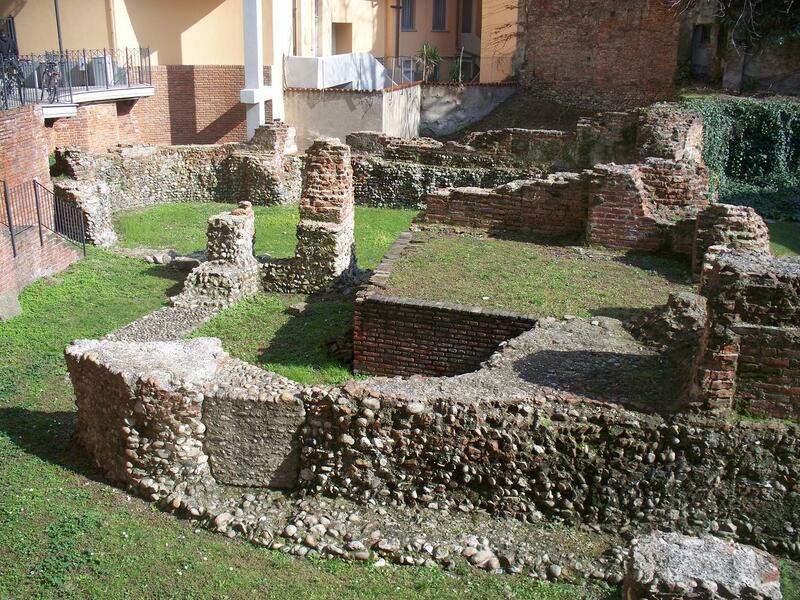 The Roman connection with Milan is actually quite strong – in the late third century, Maximian built his palace here when the Empire was split, with Diocletian ruling from Nicomedia (in modern-day Turkey). 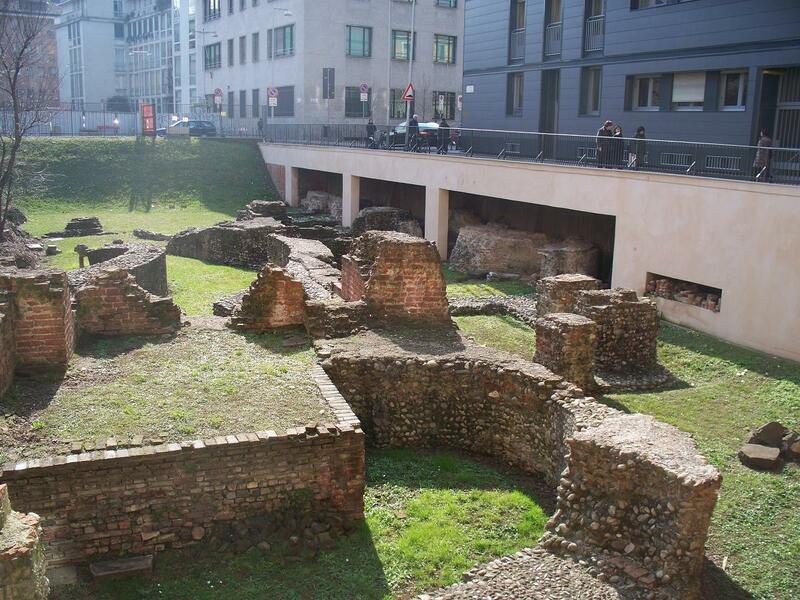 The ruins of the palace were discovered during the second world war bombing of the city. Lots of history to be discovered here! 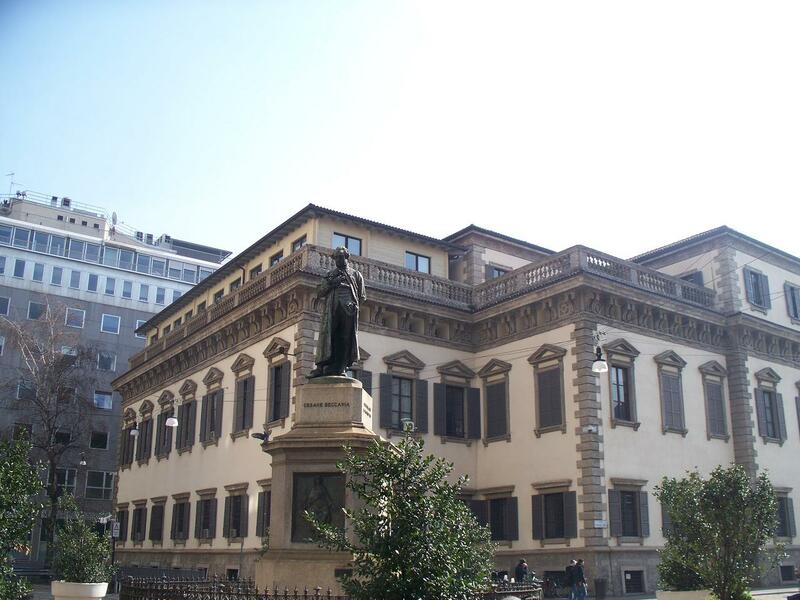 I run a history-centric blog on Blogger, where you can read more about the history of the city if you’re interested! Unfortunately I’ve not been back to Italy since – I suppose it’s a combination of nervousness and a distressing lack of funds. 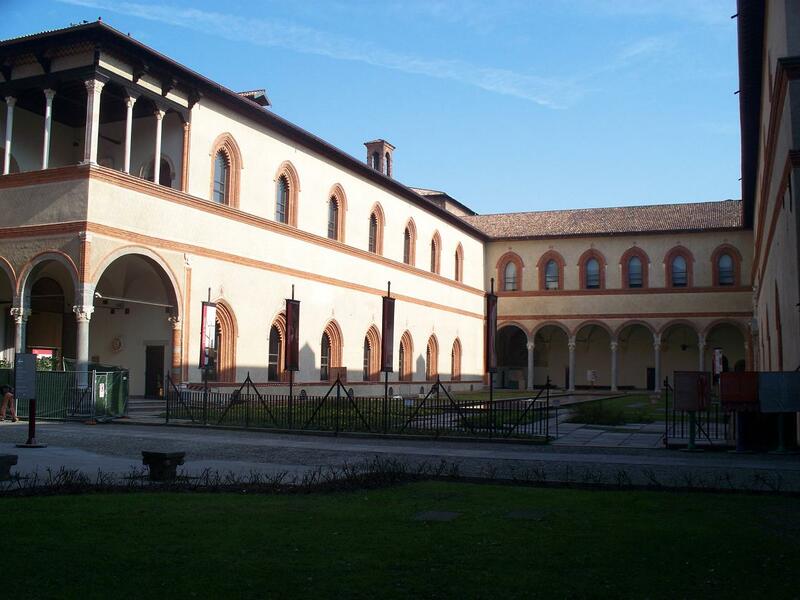 But it’s something that has been on my mind a lot lately, partially the reason for writing this blog, and I hope that I can get back there soon – certainly to revisit Milan, as a start! Yay, it’s another post! If you read my tagline above, you’ll see that one of the things I love is board games, but before I start talking about that in any great depth, I thought you’d all love to know a bit about my very first experience with this world. See, the board game world that I enjoy so much isn’t the standard fayre of monopolys, clue(do)s, and whatnot. It’s more what I jokingly call “serious board games”, the sort that require a massive amount of capital to support, not to mention whole rooms given over to store them. That’s not to insinuate there’s any sort of snobbery going on – I enjoy a good murder mystery, or race to buy up London, as much as anyone – but rather I just enjoy games that have more immersion involved. Carcassonne got me insta-hooked on tabletop gaming, and since then I’ve been sinking untold thousands of pounds into the hobby. It’s something I enjoy, so what the hell, right? 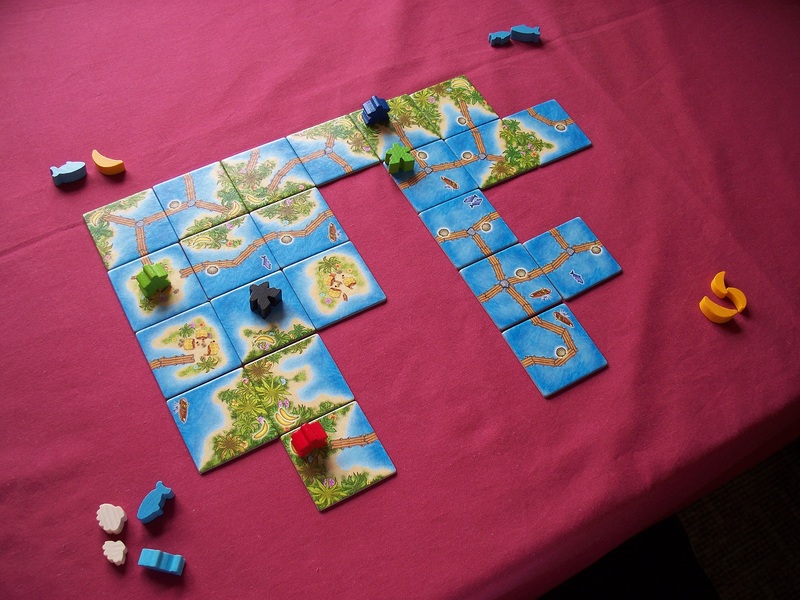 But why Carcassonne? What was so special about that game that tipped me over the edge? Well, I don’t know. Highly unsatisfactory answer, I know, but still – I don’t! It’s a really elegant game, with perhaps the perfect balance of strategy for me to enjoy it right out of the box. If you watched the whole video (and if you didn’t, shame on you! ), you may have picked up on how easy it is to either play confrontationally, messing up other peoples’ plans and muscling in on their farms or cities, or equally you can just have your own little corner that you can make your own, and hope you have more features at the end. I’m sometimes a lazy gamer, and I don’t want to have to sit through half an hour of strife and torment while I try to continually adapt my plans for victory, sometimes I just want to put some tiles down and score some points, y’know? 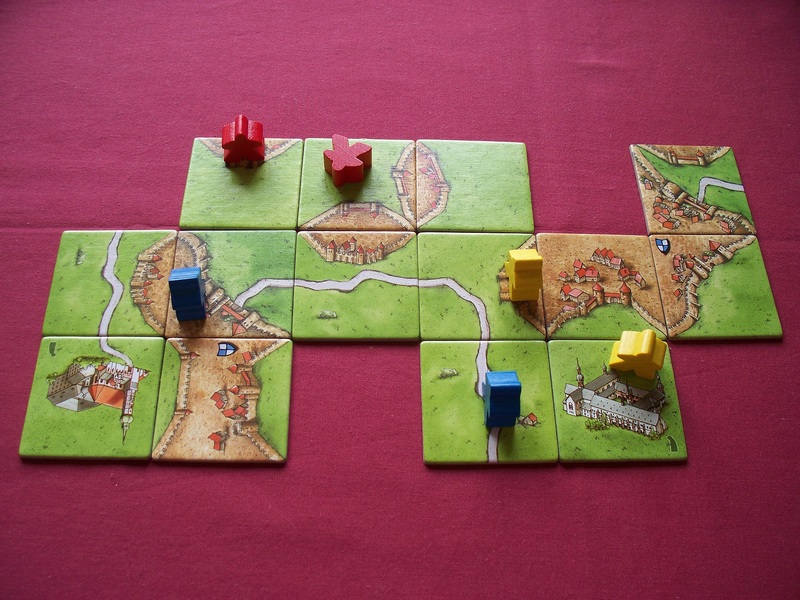 There are a lot of expansions for Carcassonne, which adds greatly to the depth of the game without really being all that complex (I think). I think we’re currently looking at the ninth “big box” expansion coming out this year, but there are also a whole host of smaller boxes, right down to single-tile expansions. Unfortunately, I don’t have all of them (to my lasting shame! ), but I have a damn good selection, let me tell you! If I had to pick my absolute favourite, I’d probably say it was Inns and Cathedrals. It was the first large expansion for the game, and basically added more tiles, including tiles with inns and with cathedrals on. Genius, right?! 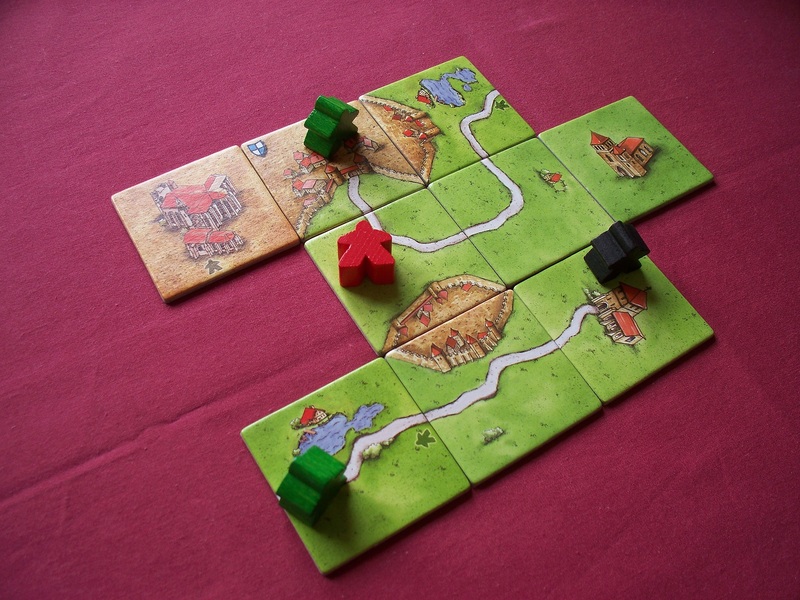 To add to the main game shown above, the inns appear on road tiles, and their presence on said road makes it worth two points per tile when completed (though still one point at the end of the game). Cathedrals are full-tile city tiles, and when said city is completed it makes each tile worth three points – however, at game end, if the city was incomplete, it scores you nothing! The potential for adding cathedrals to an opponent’s incomplete city near the endgame is always sooooooooo tempting! Muwahahahaha! (I’m not actually a jerk like that – I like to think I’m a really considerate gamer, anyway!). The smaller expansions all add something, well, small to the game – my favourite is the Cult, six tiles which work similarly to the monasteries, though if you get a cult piece and a monastery together it becomes a fight to see who completes the feature first! Whoever loses gets no points for their own feature. 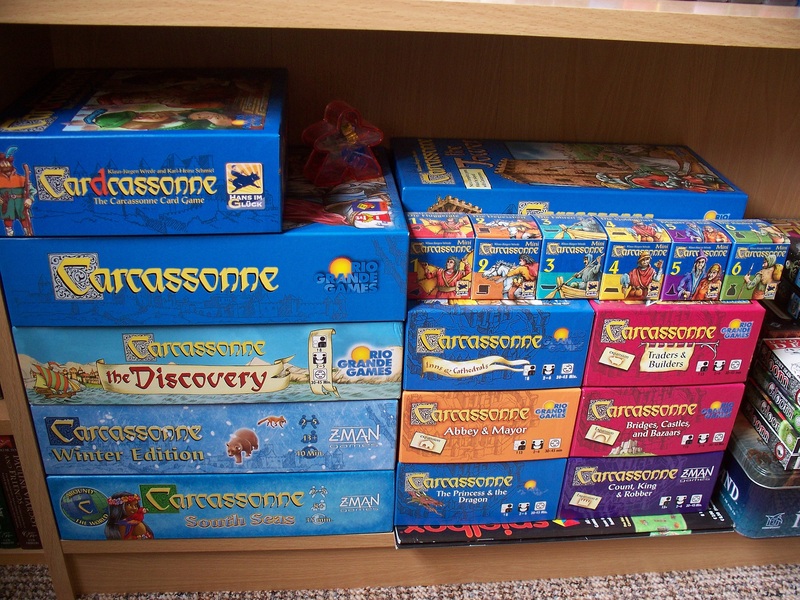 A lot of the Carcassonne mini expansions have been made available through Spielbox magazine, which is a German game magazine that does a lot to promote tabletop gaming. Published in German, with an English-language version also available, it’s definitely worth checking out! Carcassonne latest addition, the Cathedrals of Germany! As well as expansions, there are ‘re-imaginings’ of the game released, the first being Hunters & Gatherers, a Stone Age version; Discovery; Winter Edition, and most recently, South Seas. All of these use the basic mechanics but with subtle twists. I’ve only played Discovery and Winter Edition, which are both as much fun as the regular game, though without the same level of expansion (all except Discovery have had some form of expansion to them). Which leads me on to another point. 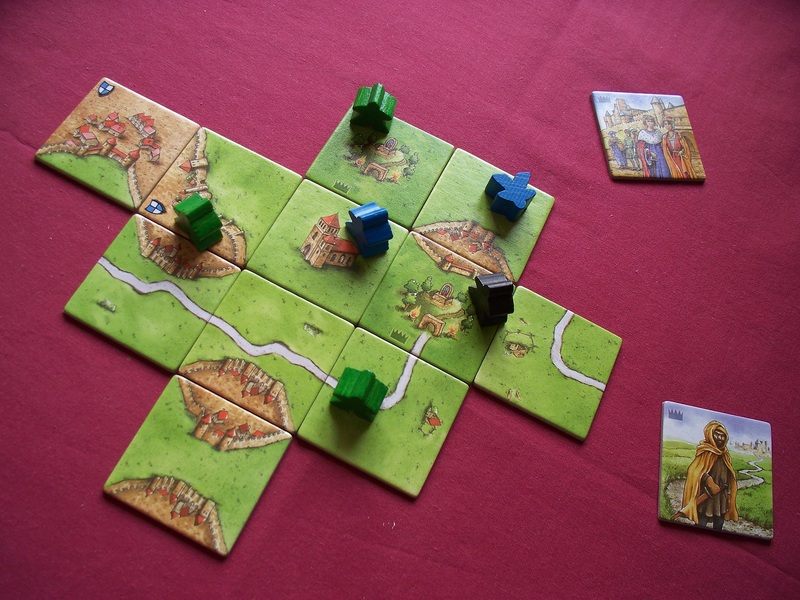 I’ve played Carcassonne a whole load of times, in large groups and one-on-one. It’s an experience that is always changing, and always fun, and the level of expansion incorporation can make things as easy or as complex as you like. Personally, I enjoy at least a couple of expansions being involved. 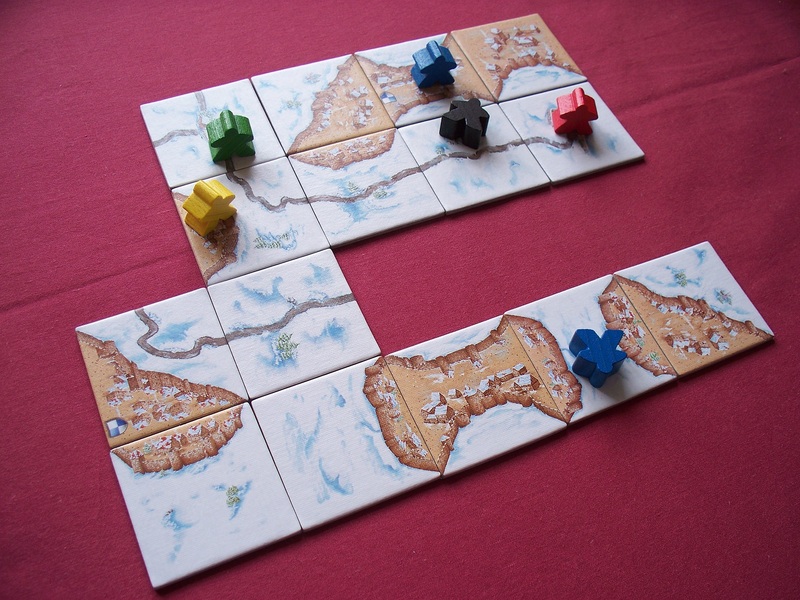 There are two small expansions of River tiles (River and River II) which have become practically ubiquitous to the main game, but in addition to these I would usually involve at least Inns & Cathedrals, Traders & Builders, the Cult pieces and the King expansion. There’s just enough going on with these that I feel the game is in a constant flux until the end. (I also have the ‘mini expansion’ of twelve tiles published in Games Quarterly magazine mixed in with the base game tiles, and while usually expansion tiles have a watermark telling you which set they came from, this one doesn’t, so I can’t split it off. Just thought you ought to know). Playing with all the expansions can be a bad idea, as there is so much going on – not to mention, so many tiles – that it can slow the game down. I’ve done it once, and covered the dining table with the game. 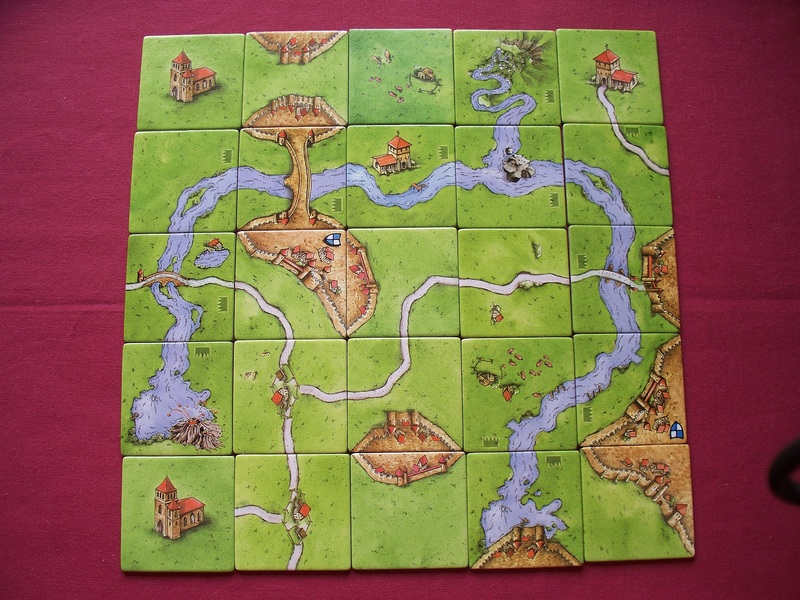 In case you’re interested, the Guinness World Record for the longest boardgame play was for a game of Carcassonne in Germany in 2006, which lasted nearly 43 hours and used nearly 4200 tiles. The winning score was 4703 points! Sheesh! 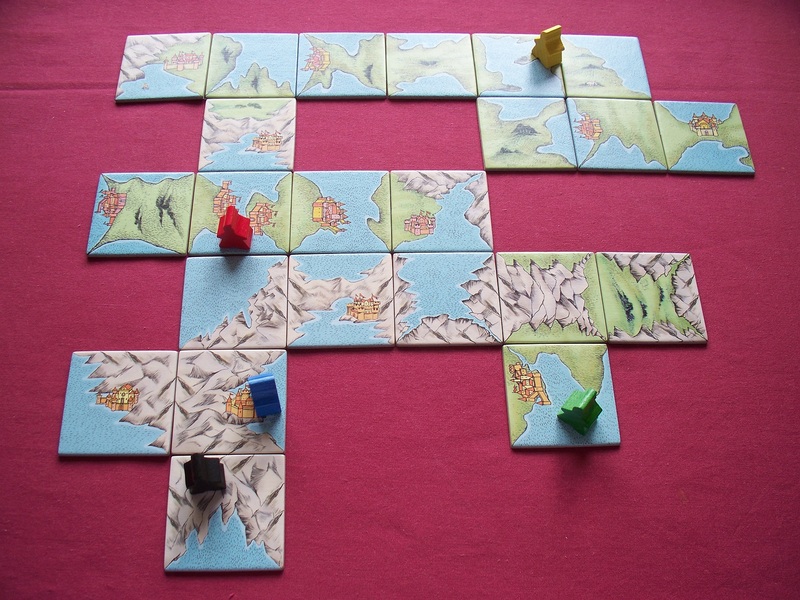 Carcassonne was the game that got me into this delightful mess, and it’s always fun to get it out every once in a while. 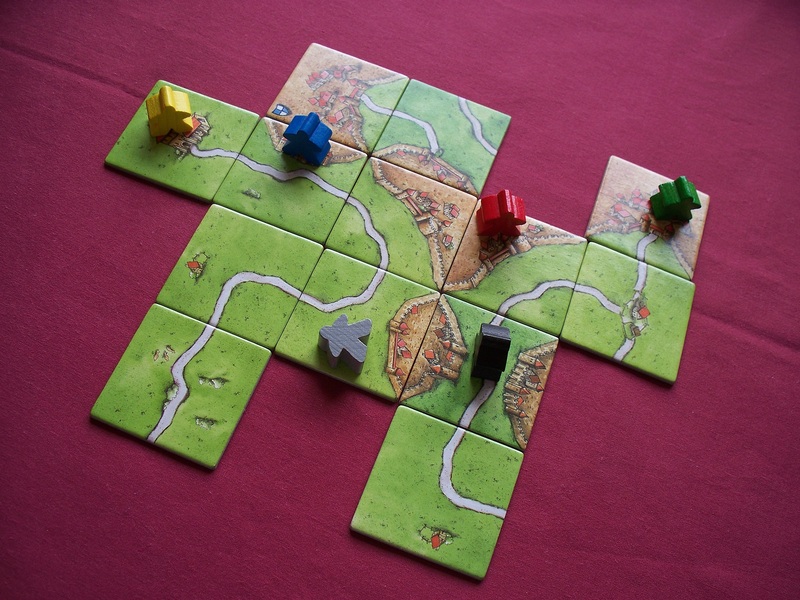 As always, I’d love to hear what other people think of Carcassonne – including favourite expansions! Drop me a comment! 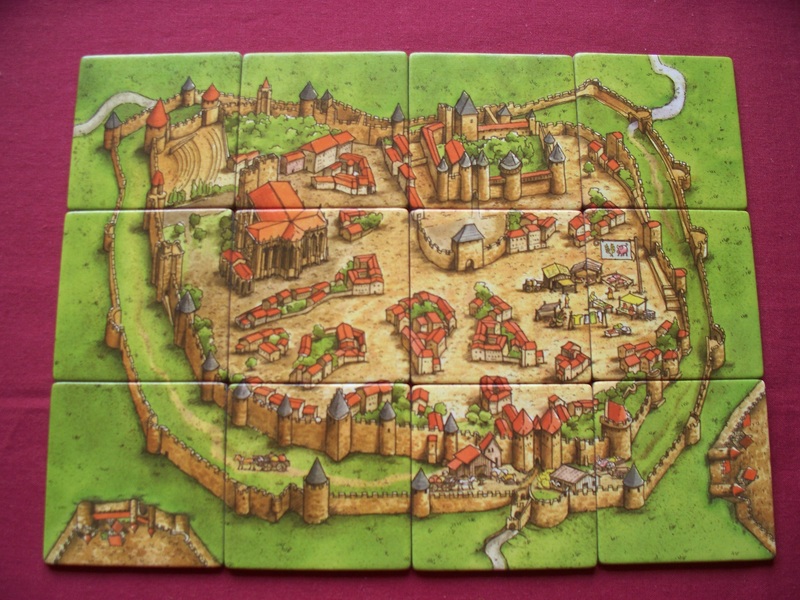 The Count of Carcassonne expansion brought the actual citadel of Carcassonne itself to the game!